Yes, you can add an entire domain (or wildcard) such as @gmail.com or @aol.com to your “Do Not Mail” list with GroupMail’s Exclusion List Manager. 1. 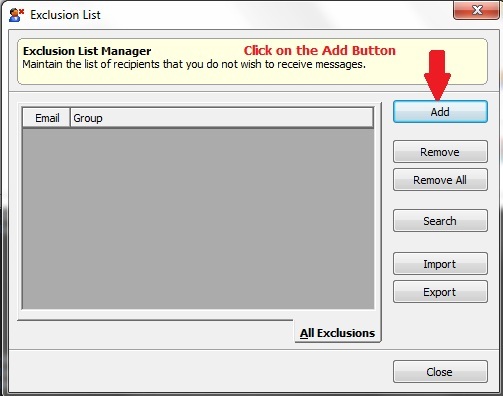 In GroupMail, go to Tools/Exclusion List Manager to open the Exclusion List Manager screen. Then, to add a new email address or wildcard domain to your “Do Not Mail” list, simply click the Add Button. 2. In the Email field, enter the domain that you want to exclude from mailings. In our example we are excluding all @yahoo.com email addresses. Ensure that you include the @ sign before the domain as the exclusion list relates to the email address format for domains. In the Groups field in the example below, we have selected All Groups. If you want to exclude an email address or domain from a specific group (but not All Groups) you can also select a specific group/mailing list from the drop-down list in this field. 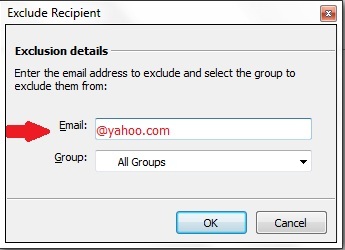 From now on, all recipients with an @yahoo.com email address will be excluded from your mailings to any (or All) groups. Interested? Get our award-winning email newsletter software and start adding email addresses and domains to your own “Do Not Email” lists in GroupMail.